It has been suggested that The City of Edinburgh Council be merged into this article. (Discuss) Proposed since August 2018. The politics of Edinburgh are expressed in the deliberations and decisions of the City of Edinburgh Council, in elections to the council, the Scottish Parliament, the House of Commons and the European Parliament. Scotland constitutes a single constituency of the European Parliament, in which the electorate of the City of Edinburgh participate in electing six Members of the European Parliament (MEPs) using the d'Hondt method of party-list proportional representation. On 18 September 2014, Edinburgh voted "No" in the Scottish Independence Referendum by 61.1% to 38.9% with an 84.4% turnout rate. The current Lord Provost of Edinburgh is Frank Ross, who replaced Donald Wilson in 2017. In Scotland the Lord Provost fulfils many similar roles to that of a Mayor in some other countries. Elections to the Council are held every four/five years electing 63 councillors. The most recent elections took place in May 2017 and the next election is in May 2022. Prior to May 2017, the Council was controlled by a Labour/Scottish National Party coalition which continues following the 2017 election except that the SNP is now the largest party. The Council is currently the second highest employer in Edinburgh, with a total of 18,617 employees. 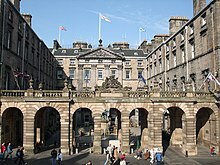 Prior to the Local Government (Scotland) Act 1973 Edinburgh was administered by the single tier "Edinburgh Corporation", which covered the "City and Royal Burgh of Edinburgh". As such, the Edinburgh Corporation was responsible for local government services, such as the Edinburgh Corporation Transport Department (Edinburgh Corporation Tramways until 1928). The Edinburgh Corporation had the power to make 'Burgess' (freemen) of the City of Edinburgh and to grant "Seals of Cause" to Guilds and trade organisations. The Edinburgh Corporation awarded Burgess Ticket through the Lord Dean of Guild, an office in the Corporation. Like the Corporation of the City of London, Burgess Tickets were often awarded along with a 'Freedom Casket' – a container to hold the ticket. Bodies such as the Merchant Company of Edinburgh, the Incorporated Trades of Edinburgh and The High Constables of Edinburgh formed part of the corporation, contributing councilors and law enforcement officers. The Edinburgh Corporation had the power to institute these organisations via the granting of a "Seal of Cause". This empowered the societies as "a legal corporation with power to hold property, make its own by-laws and regulations". Other organisations to receive the "Seal of Cause" include The Royal Burgess Golfing Society of Edinburgh, who received their seal on the 2nd July 1800. The history of the corporation lives on elsewhere around the city, for example in the name of the members of Muirfield golf club, who were granted a charter by the corporation in 1800 becoming "The Honourable Company of Edinburgh Golfers". Many of Edinburgh's ceremonies and traditions date back to the days of the Edinburgh Corporation, such as the Edinburgh Ceremony of the Keys, where the Lord Provost symbolically hands the keys to the City of Edinburgh to the monarch, who hands them back to the Lord Provost proclaiming "that they cannot be placed in better hands than those of the Lord Provost and Councillors of my good City of Edinburgh". In 1975, Edinburgh Corporation was abolished. The new two-tier system consisted of Lothian Regional Council (with responsibility for water, education, social work and transport) and the City of Edinburgh District Council (with responsibility for cleansing and libraries). The City of Edinburgh became a single-tier council area in 1996, under the Local Government etc. (Scotland) Act 1994, with the boundaries of the City of Edinburgh district of the Lothian region. The district had been created in 1975, under the Local Government (Scotland) Act 1973, to include the former county of city of Edinburgh; the former burgh of Queensferry, the district of Kirkliston and part of Winchburgh formerly within the county of West Lothian; and the district of Currie and the parish of Cramond formerly within the county of Midlothian. Edinburgh Central constituency was abolished and split between the original Edinburgh North and Leith and Edinburgh West constituencies and an entirely new constituency that was created – Edinburgh South West. For elections to the Scottish Parliament, the city is divided among six of the nine constituencies in the Lothian electoral region. Each constituency elects one Member of the Scottish Parliament (MSP) by the first past the post system of election, and the region elects seven additional members (also called MSPs) to produce a form of proportional representation. At the 2014 Scottish independence referendum voters in Edinburgh rejected independence by a margin of 61.1% No to 38.9% Yes. Turnout was 84.4%. Numerically, Edinburgh had the largest number of No votes out of all 32 council areas in Scotland with 194,638 No votes to 123,927 Yes votes. The difference between the number of Yes and No votes was largest in Edinburgh by comparison to any other council area in Scotland at 70,711. A map of the 2014 Scottish independence referendum results by UK Parliamentary constituency in City of Edinburgh, where saturation of colour denotes strength of vote. ^ "Local Election Results | COSLA". www.cosla.gov.uk. Retrieved 5 May 2017. ^ "Scottish Independence Referendum Results". City of Edinburgh council. 19 September 2014. Retrieved 3 June 2016.